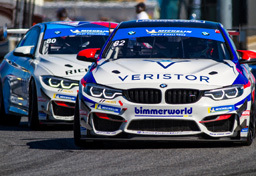 BimmerWorld Racing of Dublin, Va. finished third in both the Grand Sport (GS) and the Street Tuner (ST) classes on Saturday as the IMSA Continental Tire SportsCar Series staged a race at the Mid-Ohio Sports Car Course in Lexington, Ohio for the first time since June 2013. Team owner James Clay of Blacksburg, Va. and his co-driver, Tyler Cooke of Fort Lauderdale, Fla., were in the hunt throughout the race with their GS entry, the new No. 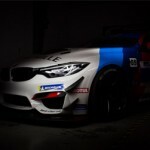 82 OPTIMA Batteries BMW M4 GT4. Clay qualified seventh with a time of 1:28.397 and was second by lap 12. Their first pit stop for fuel under a full-course caution on lap 16 dropped the BimmerWorld M4 back to seventh, but Clay was able to advance into fourth place by lap 20. Due to pit stops, he was in second place again when he made his second pit stop on lap 38, handing the car over to Cooke with fresh tires and more fuel. There were an unusual number of penalties in this race, and unfortunately, the No. 82 M4 received a drive-through penalty for excessive wheel rotation (wheel spin) during the second pit stop. Even after serving it, Cooke ran a strong fifth and advanced to fourth on lap 48 with about 41 minutes remaining. He slipped to fifth on lap 50 but regained fourth with 36 minutes left. He was the fastest of any driver in the top five on lap 54 and passed Hugh Plumb for third on lap 58 with 27:57 left in the race. Cooke set the car’s fastest lap of the 77-lap race on lap 65 with a 1:28.663 and finished third even though he had to conserve fuel at the end. The team’s ST entry had an equally impressive run. Nick Galante of Greenfield, Mass., set a new ST track qualifying record with the BimmerWorld No. 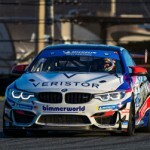 81 Veristor/Legistics BMW 328i (F30 chassis) with a time of 1:34.309 to earn the class pole. He led the first 15 laps before pitting for fuel on lap 17 under the same early caution that Clay used to make his first pit stop. Galante dropped to fifth in class after the stop but battled back to third by lap 30. He set the car’s fastest lap of the race with a 1:35.631 on lap 34, two laps before he charged into the lead again on lap 36. Galante led for five laps before pitting again to allow his co-driver, Devin Jones of Mooresville, N.C., to take over. 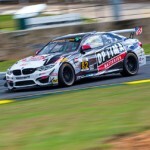 Despite never having seen Mid-Ohio before, Jones started his stint in fourth place and was able to advance to third when the second-place MINI of Derek Jones (no relation) pulled off into the infield with mechanical difficulties with about a half-hour remaining. 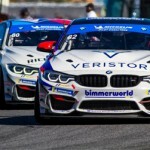 Devin Jones was then able to keep his BMW in the final podium position until the end for another strong finish for BimmerWorld. 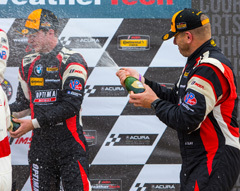 The race will air on FOX Sports 1 on Saturday, May 12 from 12:30 p.m. to 2:30 p.m. Eastern. 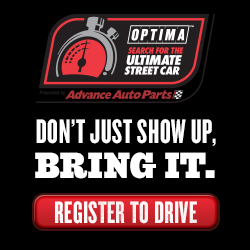 The next event is June 28-July 1 at Watkins Glen, N.Y. More info is available on imsa.com.